Comments: Team Rollbar--I LOVE you guys and your wonderful service! This review is far too long overdue. Overall: I have been using Rollbar for about 3 years now, and I have to say it has made my life a lot easier. They have a ton of platform integrations, but I have only integrated this service in Android and PHP projects. For most programming languages, they have their own API, but this product seems to be so popular that people are even writing wrappers around the API for frameworks. I would definitely recommend this to anyone, especially because they also have an 'always free' formula, which gives you the opportunity to try it out. Customer support is really decent, they're usually replying to your requests in 2 hours or less. And I'm not even in their timezone. Recommendations to other buyers: If you do notice a bug in their SDK's (which I doubt since they're not a startup anymore), don't hesitate to send in a pull request. I once did in the beginning, they accepted, and now I can feel good knowing that my small fix is probably reaching tens of thousands (or more) users. Cons: Something the grouping can work too well, and errors that are different actually get grouped together. The standards can be a little hard to figure out, and there are multiple ways to do everything. Grouping of Logs - Groups together errors so you don't get spammed. There have been a time or two this has worked against me, but overall it really helps. Not to mention, you can resolve errors and they'll pop back up if they happen again, so you know if something is really broken or just a one off developer bug. Stacktrace and Local variables - Really helps that they include the full stack trace, and if you choose, can display local variables you inject. This has made it so easy to setup some debugging features and then let them go. For those really weird bugs that you really can't seem to nail down a cause for. Environment Separation - Really helps to tell between a production (oh no! Lets fix this!) or a staging (fix it before pushing) kinda errors. I don't think I could go back to any other debugging method. In the very least, Rollbar always gives me a place to start using xdebug. At the most, I look at the information and know exactly what went wrong, and can fix it. Great product! Recommendations to other buyers: There are very few problems, and the time it saves easily makes up for them. Pros: Saves time. Usability. Features. Cons: One in half a year there's a lag between sending an error and seeing it analyzed. Not a big issue though. I'm a Rollbar user since the very beginning of the project. Before Rollbar I've switched a few ways of dealing with logs. First, I was just reading logs when needed with tail and getting a weekly batch of errors by email. That was OK for local development and tiny projects but for bigger deployments that were useless because the amount of data. Then I've found some offline log aggregation tools and these were OK but still required exporting logs, running these tools and checking results. Rollbar automates all that. You're getting a realtime picture of your errors. You can sort messages by the number of occurrences thus getting a good list to work on. Another fun part is how it charges you. The more errors you have the more you pay. Rollbar motivates you to fix things to pay less. At first, I've tried it in personal projects then in a huge commercial project that is already running for more than 7 years. Rollbar saved me hundreds of hours and I'm glad I've stumbled upon it back then. Overall: We're Rollbar customers for a about two years, moved to Rollbar after trying few other log aggregation services but none of them had features we needed or didn't deliver on their promise. We're using Ruby on Rails, integration was a breeze, started receiving error messages in less than 5 minutes. The interface is easy to use, live feed works great showing errors as they come up, resolving issues and tracking deploys flows works perfectly. Also I can't recall when Rollbar had downtime or a bug, yet we see new gem releases regularly. I wish other services we use had such a robust infrastructure as Rollbar do. Also I'd like to mention their exceptional support, with very quick responses from highly qualified agents that solve your problems spot on. With Rollbar tools we manage to resolve majority of the issues as they happen, before customers contact our support teams. Pros: Simplicity, Ability to integrate with tools and our application to track real-time issue. Overall: At DocEngage we have been using Rollbar for more than a year now. We track real-time exception and respond to the issues quickly, sometimes we reach out to our customers before they find time to report the issue. This yields very impactful customer gratification. It also helps us to pinpoint the issue with real use case and evidence. When we have issues with manful traces we observed there is less tension between developers and quality/support team. We tried many competing real-time issue tracker and settled with Rollbar for its simplicity and integration capabilities. As far as collaboration is concerned, we love the way it's integrated with JIRA and HipChat. Recommendations to other buyers: Their free plan helped me to get started and we loved the product comparing many other products that we evaluated in the same functionality. Overall: Rollbar is a must-have for the debugging toolkit. 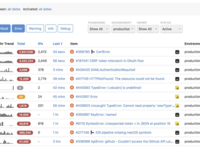 You get errors reported in one place, with history, tracebacks, all request data, user data and so on. Capturing of locals and args is *incredibly* useful and speeds up debugging greatly. You can easily have many people looking at a bug at the same time. The interface is really clear and easy to use, even for the non-dev teammates. You won't be needing much support, but when you do it'll be both very responsive and very effective. Setup is easy and Rollbar never gets in the way of your code. Just add that integration with Slack and you'll find Rollbar indispensable. Massive opportunity for squashing bugs quickly. Definitely do recommend! Pros: We have been using Rollbar for last 3 years and we are not planning on quiting! WE LOVE IT! Easy to integrate into our products. Maintaining crash-free app became a lot easier. Support on HIGHEST level. INTEGRATION with JIRA is also a great add-on. Cons: Integration with JIRA could be more advanced. In our company we use kanban boards and it would be a great feature if we could prepare tickets from Rollbar to automatically have every necessary field filled in. Cons: Rollbar is reasonably good at de-duping the same errors and grouping them into a single item, although that's not yet flawless. They've also got a query language that we've used a little but, although in our experience it is pretty slow to return results (which could totally be on us). Overall: Rollbar let us drop in an SDK that automatically wired up to capture browser errors without a ton of work on our end, which was a huge time-saver. Pros: I like that it sends notifications if something goes wrong and your team can stay alert about it. It's pretty nice to know if something is down or something isn't working. We also use it to track custom events when some logic isn't behaving as expected. For example when server returns a new Key value that is not handled on client side. Cons: The notifications customization is pretty hard and not clear. I tried to turn off some part but I couldn't do it only to myself. You (seems) can only turn it off for the "team". So I end up creating a filter in Gmail. Overall: Rollbar is an absolutely fantastic service and highly-responsive support if you ever hit an issue, all at a very reasonable price point. I can't recommend it highly enough. Pros: Rollbar was very easy to learn and to navigate, which was a massive plus. Having our own website programmed from the ground-up, it was crucial we had a software that detected and located any errors and/or bugs within our website so they could be fixed/eliminated. 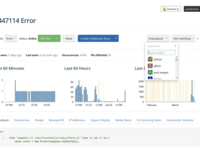 Rollbar provides real-time bug tracking, which saved us and our programmer LOADS of time as we located any issues quickly and prevented any possible website crashes/any unnecessary downtime. Cons: I don't have any cons; Rollbar has helped us to the fullest extent. Overall: Overall, Rollbar has worked great for my business and our website, and if any problems ever arise with the software, they have an excellent support team that responds quickly and accurately. Pros: Very quick to install, intuitive configuration and easy to understand UI. Overall: Rollbar has been helpful to us in all of our web app development projects. We currently use it across 3 different applications. Using Rollbar has saved countless hours of debugging and helped us fix bugs much faster than before. Easy to integrate (5 minutes) into apps. I've found the UI to be far more intuitive than others. Recommendations to other buyers: Rollbar is an indispensable tool for building web apps. 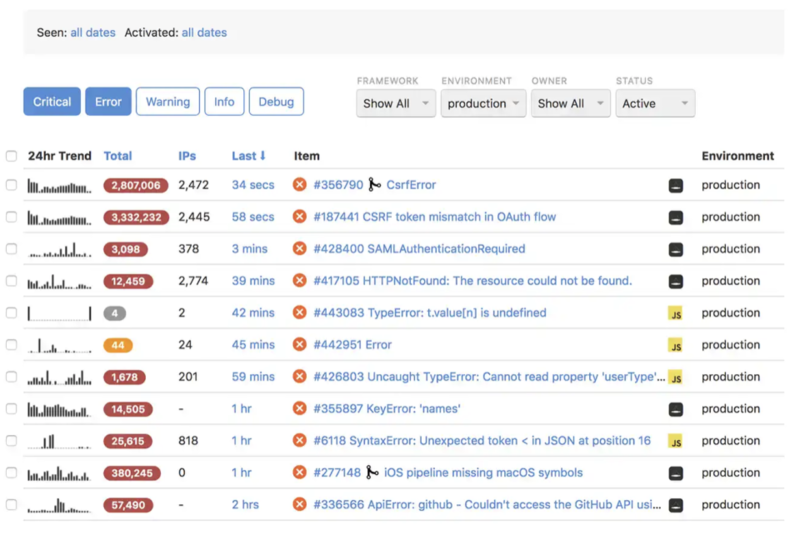 Overall: At Nightwatch.io, we are genuinely impressed by the error tracking power that Rollbar provides us. With its numerous integrations, we pipelined the error messages directly to our chatroom so we can eradicate bugs right away. It's one of those systems that are so useful you don't even think about not using them when starting a new programming adventure. * The gem providing Resque support is developed by a third-party and doesn't seem to get much use (1 watcher and 4 stars as of the time of this review). Honeybadger provides native Resque support in the official Ruby gem. * There doesn't seem to be any search functionality on the documentation page. * No documentation and a slightly unintuitive workflow for one of the integrations we use. Cons: As an owner of a start-up, I wish the price was a little bit better if the free version isn't enough. Overall: Starting to use a consolidating error log was a game changer for our developer (and the users of our site). In our company, we try to spend every Thursday to eliminate all the bugs from the site and categorise them as Error or Warning and give them better titels. An effective tool for catching mistakes in published code. Pros: Rollbar is a technical support team's dream. I rarely walk past our tech department and fail to see this on their screens. It allows you to monitor errors that your clients are experiencing and triage them appropriately. Sometimes Rollbar can help solve the problem with little diagnosis when consistent issues arise. I love the free plan that allows you to view 5,000 errors each month. For a small operation, this may be enough. Cons: After moving on from the free plan, the cost can be prohibitive. While the cost does increase, you do get what you pay for. We have spent time on all 3 plans that Rollbar offers, and have found our happy medium on Essentials. Overall: Customer Service is hilarious! They will walk it with you and they actually have personality! So happy to work with CSR on a regular basis. Pros: Free package comes with high limits, Github integration is satisfying, easy to setup and manage. Cons: Honestly, nothing so far. Rollbar is the best option when compared to other alternatives, in terms of price/value rate. Most projects can use free version of the Rollbar without any hassle. Pros: Rollbar reached us out when they detected a problem on our production site and provided their help which was an awesome experience. Installing Rollbar on our Rails app was very painless. Love the email notication, as soon as someone sees the error Rollbar send email alert which helps to resolve issue faster. Cons: We noticed that Rollbar also considers AJAX request in page load time, we need an option to disable this. Pros: The ability to know which user experienced a problem when using the software before the user reports the bug. Combining that with the debug information, I'm empowered to follow up with the user about the problem notifying them of a potential fix even when they never submitted a bug report. Cons: I love the free plan, but the next plan they offer is $30/mo. I wish there were more side-project-friendly pricing options. $30/mo for a project I host for free and is open source is a bit much. Overall: I switched to Rollbar as an alternative for my side projects since Logentries doesn't offer a free tier. Logentries has a complicated, real-time UI. Sometimes that UI can feel a bit laggy if you've got a lot of logs coming in. Rollbar doesn't have this kind of complex UI so it feels faster and simpler. I'm beginning to prefer it over Logentries. Recommendations to other buyers: When integrating, look for packages that help with integrating your framework/software. Laravel has a great one that makes integrating painless. Also make sure you're sending user data to Rollbar, it's very valuable. Pros: We have been using Rollbar for over a year now and it has been really helpful for our engineering team. One of the best features is the solutions tab which provides community answers to common problems. Cons: Free plan is just not enough for bootstrapping startups. I wished there was some sort of pay as you go model. Overall: I'm using Rollbar since 2014, and it's the greatest tool for track errors into my RoR application. It says to me when an error happen, where and who. I saved a lot of money thanks to rollbar, 100% recommended. Pros: The setup is easy, and the product is very feature-rich. It is powerful and integrates with popular tools (e.g. Github, Slack) to tie into your team's processes. I like being able to push errors from different platforms and languages into one system for alerting and reporting. Cons: The UI generally stays out of your way, but this can make configuring certain things a bit tough (e.g. custom error groupings uses a JSON configuration). We just add simple Rollbar code and it catches all unhandled exceptions. Very useful and simple feature, that we use. We add some asserts on the most complex part of the code, to catch potential logic errors at the very beginning. When you have to test the production. Instant error logging helps save time. 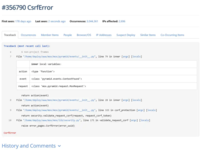 Each error can be assigned to the developer and can be marked as resolved when done. Very useful. The new tool, it allows us to create detail data queries. Very powerful tool for the analysis of problem areas in our code. Cons: Price plans based on the number of requests. But if your project didn't have a lot of errors all looks good. Pros: It's a great tool to manage your exceptions and see right when errors are occurring that could impact the customers. We use this in conjunction with alerting tools to see when a deploy breaks something. Viewing a project shows recent errors, frequent errors, lots of helpful data. Cons: No easy way to consolidate all the projects into one view. Overall: We are using Rollbar since 2016, and it's the greatest tool for track errors into our ruby on rails applications. It's super easy to setup and use. Great dashboard and super clean user interface. When an error happen, you have the situation under control. I saved a lot of money thanks to rollbar, super recommended!! Cons: The price is slightly higher than alternatives. But it's worth to pay! Overall: I've used Sentry and Bugsnag. As I can't be satisfied with them, kept finding the better one. Finally, I found Rollbar and have used it for more than 1 year. Pros: The main user interface is fairly detailed in providing information that I need most. the ability to sort and filter errors and notifications saves a lot of time and effort. Overall: I rate Rollbar 5/5. It is a great piece of online software. Really recommended to all application developers. Pros: Simple to get started and setup with a really good UI. Cons: Can be expensive if you have a large volume of errors or large traffic site. Overall: Really enjoyed the product and only replaced in with on-premise Sentry. Highly recommended. Comments: I've been dipping my toes in with lots of solutions lately, looking for anything that would provide me with the kind of insight I need to build great products. Honestly, the competition is stiff right now. There are so many good tools, but Rollbar is hitting all of the right notes. It took me literally 60 minutes from deciding to try it out to installing, logging a test error, injecting into our production packing, push some environment segmenting variables over, and then fixing actual errors that I had somehow failed to catch before. I emailed back and forth with the representative that reached out to me as I was getting going, and was happy with the responsiveness too. I don't want to name names, but I pretty quickly uninstalled another system's "RUM" script shortly thereafter, and then proceeded to ditch the default email alerts in favor of a beautiful Slack/Asana/Bitbucket integration setup. Rollbar is SLICK. Thank you! And my customers would thank you if they knew what you were saving them from! With a little elbow grease, Rollbar is a great log aggregator! Cons: The thing I disliked the most was the time it took to implement. After installing the Nuget package, you have to manually wire it up to Rollbar. It took a few days to implement it across 3 different hosted applications (ASP.NET MVC, Web API 2, and Azure Offline Data Sync) using SOLID and DRY principles. Once it was setup, though, it works great! Overall: Log aggregation across multiple .NET applications. Recommendations to other buyers: This is perfect for Startups. The Team is very responsive and helped us get thru the integration quickly. Comments: I own most of the backend infrastructure for a small non-profit. As we started to roll out our product to more users, I wanted to be able to capture any server-side errors that might be preventing people from using our software. After researching a few different services, I settled on rollbar due to their pricing, their ease of integration, and their ability to track events to a specific user. I've been using the service for almost a year now, and I couldn't be happier with the decision. On a side note: Due to a widespread internet outage one month, we quickly used up all the events in our free plan. Though rollbar shared zero fault, when I contacted their support, they credited our account with all of the events from that time period. Amazing customer service! Cons: Support is a bit slow to respond, but after some initial lag they were helpful. 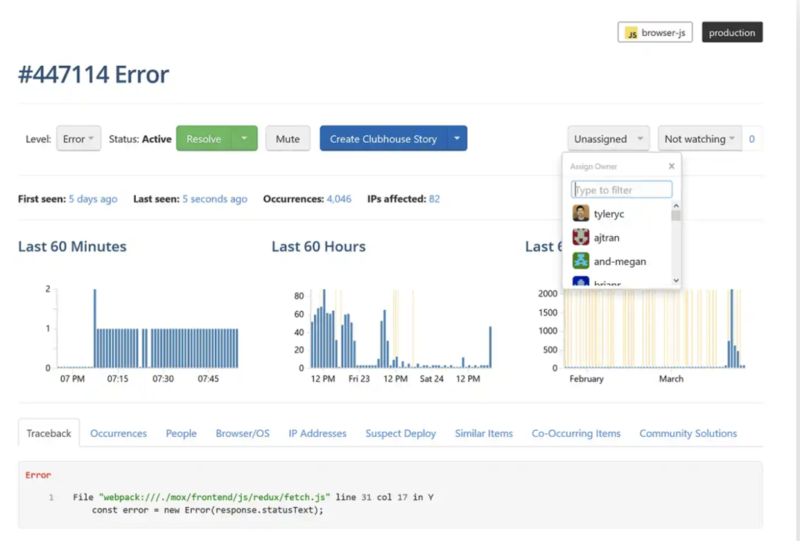 Overall: Rollbar is the only error-catching and analyzing platform you'll need. It's full of awesome feature functionality and analytics to ensure you can track down the bugs in your software. Cons: Pricing could be more approachable, but worth its weight in gold if you catch a bug early. Comments: We recently migrated our staffing application from Laravel 4 to Laravel 5. Rollbar has been a terrific help since the application needed a significant portion of its codebase updated. Installing Rollbar reporting in has helped me pick up errors that I would have otherwise missed. While the error reporting is terrific, I've also appreciated the ability to receive daily digests for both errors as well as log items. Rollbar has added peace of mind as this application deals with information that we don't want to lose. People aren't happy when a bug in the code erases their work! There's no doubt in my mind that Rollbar has improved the quality of our application. Thanks for a great product! Comments: As Google App Engine for Python users, we have some reporting logs within the system that are already quite comprehensive and great for debugging. When a team member decided that it was a great idea to implement rollbar, we were absolutely amazed by how much more comprehensive the error logging became. We can find very detailed information that GAE could not provide, such as request headers. Also, it generates a report on each error and how often it happens. This makes it easy from a quality assurance and product management perspective on which errors that we should fix first. Additionally, it allows us to fix errors that customers have not reported. Comments: I was truly impressed when I tried out Rollbar. I'm new in the web application development game, so I'm learning the right tools to use and the services that help as I go. I found out about Rollbar after some searching of application monitoring. I found out that not only is it easy to use out of the box, but it's also a cost effective solution. I develop apps on Heroku and I was even more excited to find that it was an out of the box add-on. After about 30 seconds I was up and running with exception tracking and notification through Slack. I couldn't be more pleased with my decision. I look forward to continuing this partnership in the future. Overall: We integrated rollbar super quick into our rails application and can't live without it. Recommendations to other buyers: use it and your application will be much better! Comments: At Castle.io we've been using Rollbar since the very beginning and we love it! Simple to integrate in all our environments (Ruby and node.js), great Github / commit messages integration. You can start with a simple error tracking and then get more detailed reports and filtering as you grow - this has proved to be extremely useful to us. Other things we've really grew to enjoy are comprehensive diff views for deployments, very detailed error occurrence details (including always helpful curl example) and graphs, which are extremely helpful when reviewing application status. Much more reliable & stable than Airbrake. Pros: Easy to use interface with list of errors. It'll group similar errors together. I like the option to link to a case (e.g. JIRA) for each error. It was pretty easy to setup in our app too. Cons: Sometimes it is hard to sift through all the errors and determine which ones are high priority. Comments: Before using Rollbar. We had our own hosted app for exceptions. We had lots of troubles with apps that had lots of exceptions. Rollbar helped us having our different apps grouped by our clients. We could setup integrations as Slack easily and we are planning to add more. The UI its easy to use and the information is well displayed. Before trying Rollbar we tried lots of other apps and we decided for Rollbar because it was easy to setup with our Rails, Java and Angular apps and had all the features we needed. They also have a good Demo to convince your clients to use it. Comments: Rollbar is smooth, easy to use, fast, and intuitive. It captures errors from a variety of languages with no hassle - including quick setup instructions that are so easy you can copy and paste them. Very competitive pricing, including a free plan that will cover a great many people's needs, makes this a no-brainer to log and collect errors painlessly. Say goodbye to an e-mail inbox filled with individual error reports. This is one of the secret weapons I use with my clients to impress them with proactive fixes of errors they haven't even reported yet. Rollbar all the things! Comments: The no. of integrations possible in Rollbar is mind boggling. Exception tracking is one of the major pain point in DevOps and Rollbar eases and automates the entire process. The automatic error grouping works like a charm. We internally log all user sessions (anonymously). You can map errors to user_ids and session ids as well. So, using Rollbar API and custom data sent with the exception, i can use it to track user wise exceptions. Having tried, used and paid (non-free tier) of all the competitors in this space, this is the best one. 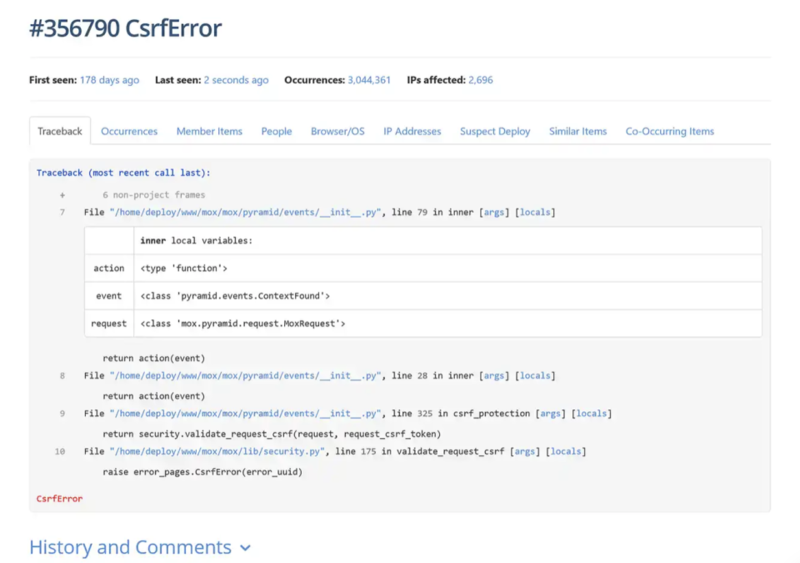 Overall: So in past we have used many error handling tools like sentry and errlytics but when we start using rollbar it is just an awesome experience in terms of ui and error logging. I recommend other companies to use this , would really benefit development with this tool. I thought the customer support was great. Pros: I really think the ease of use of this software is a huge pro. I could not get over how easy it is to use. Cons: I honestly cannot say there are really any cons for this software except for maybe the price slightly. Comments: You can't call yourself professional without error catching. With the discovery of Rollbar we found a new world: catch the errors from the client side. You can't always found all your bugs or replicate every scenario; this is where you need Rollbar. It's amazing how we can handle the errors before the client come to us. We don't need to ask for screenshots or error messages. It's incredible the level of details in every log, the UI feels very comfortable. Once you try, you can't go back, so, be ready to be a professional developer.